Ben Tritle went from game show contestant to game show staffer, all in less than a year. In 2000, in the wake of Millionaire, Tritle was scanning the classified for contestant ads. He had arrived in Los Angeles the year before, hoping to make it as an actor, but he'd already given Jeopardy a try, twice. "I've been a competitive game player and I really wanted the challenge." He soon lined up three auditions. He didn't make the cut on Greed because he "didn't have the personality that could really screw somebody," and when he passed the audition for Twenty-One, he decided to let the opportunity to be on Winning Lines pass. "That was a good move," he recalls. "Nobody remembers Winning Lines now." Tritle attended the very first taping of Twenty-One, but didn't get called to be on air. In fact, he managed to be there through the entire run of the show, which lasted four months in 2000. He was on the very last show that ever aired, but on that show, he won $85,000. Tritle speculates that although the ratings were "80 to 85 percent" of Millionaire’s, they still didn’t meet network expectations of a Millionaire­-style rating bonanza. Twenty-One was also damaged by inconsistent scheduling. "There were supposed to air it twice a week, but they couldn't even manage to do that with the first four episodes, because they had to schedule around the Golden Globes." Although he jokes that he has "no personality or sense of humour," the producers must have seen something they liked in him. The Twenty-One contestant coordinator moved on to a Fox show called It's Your Chance of a Lifetime, which was based on an Australian show. Tritle was asked to play some mock games to test the format and to sell the show to advertisers. They liked what they saw, too. The producers asked Tritle to work as a researcher. Although Fox passed on It's Your Chance of a Lifetime, Tritle's name was passed along again, this time to the producers of a new syndicated show called Street Smarts, which is vaguely like Jay Leno's "Jaywalking" segment. Street Smarts had an on-again, off-again existence at first, and in one of the off-again lulls, Tritle tried out for Jeopardy. "I slipped through the cracks," he jokes. "I barely passed the written test, but I knew how to emphasize what they are looking for. If you're optimistic and have a warm personality, that will show through. A simple thing like smiling can really help." By the time he was called to appear on the show, however, there was a potential problem. Street Smarts was back on, and Tritle didn't want the fact that he was working on another quiz show to be a problem. It wasn't. However, to avoid the appearance of impropriety, the show decided he'd use one of his other two jobs for his on-air billing. He'd be an apartment manager. His third job is guiding tours at Universal Studios. "I actually wanted to say Tour Guide, but was told that it wouldn't do well to advertise another studio's product on the show." Tritle decided not to study for his appearance. "College proved one thing to me: I hate to study. I'm a slacker. The last thing I truly studied for was the script for the Universal Studios Back Lot Tour, but that was something that had practical daily application. It's a little more difficult to insert anti-popes or Nobel prize winning economists into daily conversation." His first game actually went very badly. He had a hard time adjusting to the buzzer and went into Final Jeopardy in third place. But by doing a little math, he realized what he needed to bet to win if he got lucky and the two women ahead of him got Final Jeopardy wrong, but he didn't. Tritle did indeed get lucky. "In Twenty-One, whatever strategy you have plays out in five minutes, but with Jeopardy, you have more than 20 minutes. To have to keep your head in the game the whole time and not think about the question you just missed. Your fate can always change with the next clue." Not only did he get lucky, but he got better with each game, eventually becoming a five-time champ. "There is a subtle combination of excitement and agony that comes with winning five games," he recalls. "The initial out-of-body experience, followed by the reward, then the realization that it isn't over yet." That's because, as a five-day champ, he had a slot waiting for him in that year's Tournament of Champions, in which he went up against Jeopardy legend Brian Weikle, whose shows hadn't aired by the time the tournament had taped. "We knew he had done something extraordinary, but we didn't know what. If you haven't seen somebody play, you're up against a ghost, and in his case it was a gigantic ghost." Weikle, who had won more than $100,000 over five games and set a one-day record, would have won the Tournament of Champions, except for a miscalculation on Final Jeopardy. The tournament was also notable in that two of the semi-finalists had won zero dollars in their games, and were chosen based on their scores going into Final Jeopardy. 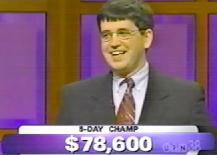 Although he was clobbered in the Tournament of Champions, Tritle did win $78,600 on Jeopardy, plus a Jaguar. Adding the $85,000 he won on Twenty-One, he has earned well over $200,000 in cash and prizes in a two-year game show career. And that's in front of the camera. Now he's making money behind the scenes at Street Smarts. Someday, he may have enough to re-launch that acting career.